Congratulations to the Center for Family Support Nathan Court Group Home athletes Peter Gatto, Hakiem Griffith, Paul Josewitch, and Darren Wobser. 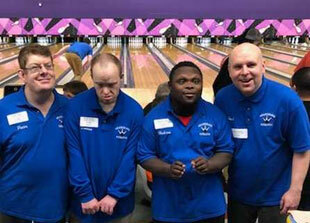 On February 3rd, 2018 they completed in the area 6 bowling Special Olympics Bowling at Ocean Lanes in Lakewood, New Jersey. Peter Gatto and Darren Wobser both brought home gold medals; Paul Josewitch won a silver medal, and Hakiem Griffith won a bronzes medal. To the Nathan Court Residents, being able to complete in the Special Olympics is more than just bowling. It gives them a chance to make long lasting friendships with not just their team, but others from across New Jersey. They all have a love for bowling, as they go bowling every Thursday with the Keansburg Kegglers at Airport plaza Brunswick Zone in Hazlet. Their coaches say they all put in a 100% into their bowling. This past Saturday February 24, 2018 they were competitors in the Central Bowling Sectional at Strathmore Lanes. Unfortunately, Peter Gatto was the only athlete to advance 2018 Spring Games Bowling final competition for the 2018 bowling season. Peter’s housemates said they are disappointed that they won’t be there as competitors, but they want to be there for support and cheer on their housemate Peter and hope that he brings home another gold medal. His next competition is April 7, 2017 at Bowlero in North Brunswick, New Jersey.